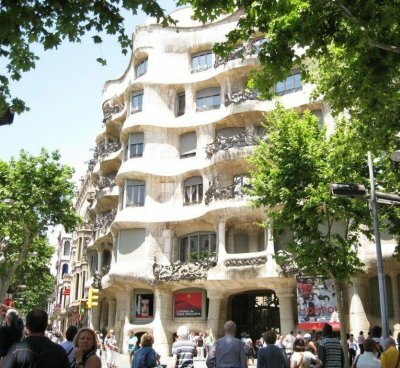 For our ninth and final city in Pat Slaon's Free 2014 Mysterry BOM, Globetrotting, we travel to Barcelona Spain. When looking at the block and the fabric chart, fabrics 1, 3, 5, and 9 are used in this block. When assembling the block please refer to the photograph of the block above or at the top of the instruction page. The illustration in the middle of the instructions is a bit confusing as two of the fabrics are not indicated with a different shade. Well Barcelona is one of the most beautiful cities in the world; home of the famous Sagrada Familia by Gaudi, and host to a wonderful and rich culture, amazing architecture, and delicious cuisine! Travel with us in this final segment in our world tour together as we walk the streets of Barcelona. Pat is a traveling girl and you can see in her 'GLOBEtrotting' adventures she goes far and wide. There are not enough blocks in this quilt for every city Pat wants to visit. So even though she lived in Europe for 8 years, she never got to Spain. Barcelona is where she will go first! 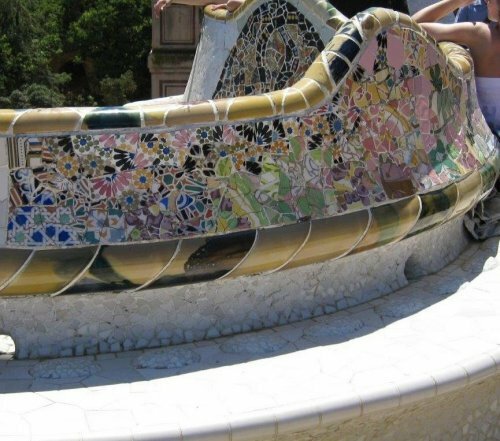 Guell Park is incredible. The tiles work makes Pat giddy with excitement. 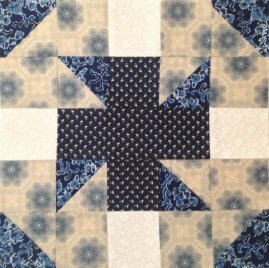 Pat’s block has a pinwheel variation in the middle, inspired by. can you guess? TILES! And the buildings are incredible. She so want to see inside these buildings, are they as wild as the outside? Next Month we work on the corners and the quilt setting! Enjoy!